Scribblenauts is returning from the dead The Tweeting Dead: 5 Zombie Celebrities Active On Twitter The Tweeting Dead: 5 Zombie Celebrities Active On Twitter While there are some celebrities who tweet for themselves, there are many more who pay someone else to do it for them, either on a full-time or part-time basis. This bizarrely means that when a... Read More , with a new games set to hit consoles later this year. The brand new title is called Scribblenauts Showdown, and as its name suggests, the focus is on the multiplayer side of things. Essentially, this is set to be a party game for creative types. For the uninitiated, Scribblenauts is a puzzle game which requires players to use their initiative. You’ll face an obstacle, and have to figure out how to get past it. You do so by writing the name of the object on the screen, and it will appear as if by magic. The last Scribblenauts game, Scribblenauts Unmasked: A DC Comics Adventure, was released in 2013. Unfortunately, while the next game in the series, Scribblenauts: Fighting Words, was in development, its developer, 5th Cell, laid off most of its employees, and the game was cancelled. However, a new developer, Shiver Entertainment, has now picked up the baton. And, as newly announced by Warner Bros. Entertainment, Scribblenauts Showdown is set to be released on the Nintendo Switch, PlayStation 4, and Xbox One on March 6, 2018. There’s even a trailer. Most of the core elements of the series remain intact, including the main character of Maxwell, the cute, cartoonish visuals, and the dictionary of more than 30,000 words. However, while there is a Sandbox mode to mess about it, most of the game is comprised of multiplayer minigames. In this titular Showdown mode up to four players can compete in a series of challenges. Players are rewarded for being the first to complete a challenge, with progress tracked on a “board game-style map”. 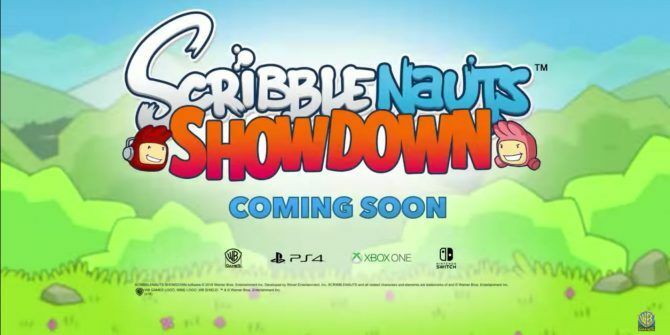 This makes Scribblenauts Showdown sound similar to games like Mario Party. A new Scribblenauts game is long overdue, so Scribblenauts Showdown is a welcome addition to the series. However, the switch to home consoles and to focusing on multiplayer are both odd decisions. So it remains to be seen whether Scribblenauts Showdown will live up to its billing. Have you ever played a Scribblenauts game? Do you consider yourself a fan of the series? What do you think of the move to multiplayer? And the move to home consoles? Is Scribblenauts Showdown the perfect match for the Nintendo Switch? Please let us know in the comments below! Explore more about: Multiplayer Games, Nintendo Switch, PlayStation 4, Xbox One.